Check out this split screen view. On the left, is a map page image and Lake Master map image–very nice. You can see where I was trolling. It was a long school of walleye that were not bunched very tight. In fact, I marked mostly one’s and two’s. Often, during summer months, that type of set-up doesn’t produce many fish. 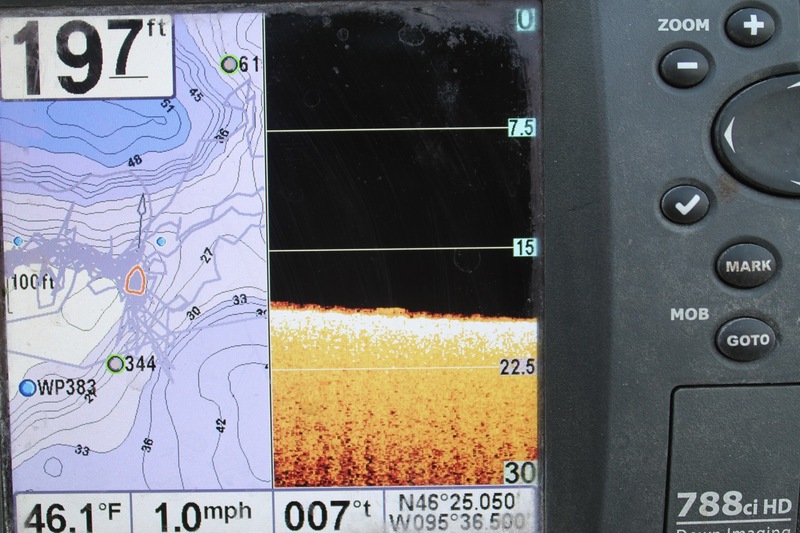 However, this was a late fall fishing trip (notice the temp in the corner of the graph–46.1 degrees), and the fishing was very good, but it took long trolling passes to keep bites coming. Check out the single walleye in the middle of the screen on the Down Imaging picture. It’s glued right to the bottom. It’s a classic, “Where’s Waldo?” moment. When I see walleye stuck to the bottom like the one in this photo, they are usually active–waiting to eat an unassuming prey. Therefore, I’ll spend a little more time with them. As I recall, we caught this fish, and it was a dandy. Check out the school of walleye under a mass of bait. Notice the clean images–no distractions. I’m not much of a tech person. I guess I don’t care to be. It’s actually been a process for me over the past ten years to warm up to graphs. Before using graphs I did all my guide work and fishing with flasher-units–better known as “Vexlars.” These units give a raw-read in the form of blips and bars that “flash” on and off the screen as things come and go. You get from a flasher what you need to get from it–but there is a learning curve and that takes a lot of time. The main problem I had with flashers as a guide is that all my clients want to know what I’m looking at. By the time they blink the “flash” is already off the screen–forever. It was, and still is, nearly impossible to show and describe to people what I’m looking at on a flasher. I bought a Lowrance graph about 7 years ago and it quit working. I bought another one that worked pretty well for a year then it filled up with water, so I decided to try Humminbird graphs. To my great relief, my Humminbirds have been great graphs. 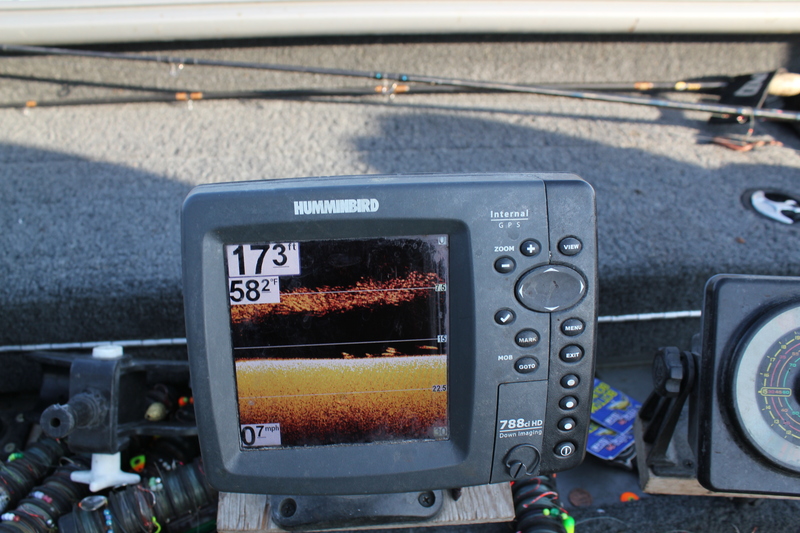 The Humminbird I spend most of my time with is the 788 HD DI combo. It’s a great color unit with a five inch screen, and retails around 600.00 give or take. I have two on board my Lund Pro Guide. One in the aft and one 3/4 the way to the front for my guests to watch. Why do I like these units so much? I think Humminbird had a happy-accident. The down imaging signal the units put out, some how, has very little noise. The screen is very easy to see and is the most crisp graphing picture I’ve ever seen. And I don’t need to make any adjustments when I get on the water–they’re fantastic. I don’t use the actual “sonar” option. I only use the Down Imaging. Before down imaging, I’ve never been fond of graph pictures because of all the crap on the screens–surface clutter and grey line garbage and over-sensitivity issues–it’s easier to read flashers half the time. I think a lot of graph users share my graphing gripes. The Humminbird DI or Down Imaging picture is clutter free. All it seems to show are fish and shapes protruding from the bottom. The color palate options are nice for the DI too–they are very easy to see in bright sun. Also, many of Humminbird units have “quick save” keys that save your favorite pages so you can get right back with having to scroll through menus. I’ll add more in future blogs. For now, while you’re outfitting yourself for the new fishing season check out Humminbirds’ stuff. It’ll be worth your while. Where’s the open water? Iowa? Maybe. It sure isn’t here. It’s leaving us plenty of time to sharpen hooks and put new guides on our fishing rods. When ever there’s down-time, or off-the-water time I just try to get my stuff in order. Once the lakes do open up in the Ottertail county area I’ll be trying to find tune my new boat and motor (a 2010 Lund Pro Guide, and a dandy 200 Verado) this particular boat and motor package has been an absolute perfect set-up for guiding–I can comfortably fish five guests and myself out of this rig and there’s plenty of room to store everybody’s stuff. It’s not just a great guide boat–a utility–but it’s also a great recreational fishing rig too. I see Pro Guides and Verado’s all over the place around here. It’s a very speedy and very sturdy rig with unlimited fishing ability. A lot of people ask about the BIG Tiller–which is the Mercury typing of it’s large tiller motors–wondering if it’s safe. You bet. It’s absolutely rock solid. The steering is hydraulically assisted and only moves when you command it to–it’s very slick, and very proven. Lund and Mercury both offer great warrantee incentive programs too–and they stick to them–they are two very upstanding companies and are very professionally operated at all levels. Is this a sales pitch? Yup. It’s also a testimony from a guys that makes his boat his office–I stake my lively hood and reputation as a professional operator on these products–as I have spent 70 hours a week in these boats every season for the past 18 years. If you have questions about a boat and motor you’re looking at I’d love to review it with you–send me an e-mail, which you can find on my web-site at http://www.meisterguideservice.com. Since it is the off-season, and we are gearing up, I’ll be discussing Humminbird products on my next blog. I think you’ll find it pretty interesting. Until then–rig good.